This was our first year at HAI HELI-EXPO as an exhibitor. We had so much fun and met so many very important people; we will be back next year. OK…we admit it. We are HAI HELI-EXPO exhibitor newbies and should have been at this show years ago, but we are not rookies when it comes to aviation component services. In fact, we are one of the oldest, most established avionics and accessory service companies in the world. We are the only authorized Universal Avionics Service Center in the United States. We are open 24 hours a day, 7 days a week for component AOG support. So whether you call us at 2 PM, or 2 AM, you will get a live person, experienced in component sales, repair, and overhaul support. We can schedule your exchange or repair anytime, day or night. Technical / Repair / Overhauls Services: Contact our go-to guy, Jerry Cable, Component Tech Rep. So you see. We may be new (to the HAI HELI-EXPO), but we’re not new. We’ve been around awhile, owned by the Duncan family since 1956. Few companies in the aviation industry, if any, are 60 years old and still operating under the same name. We have seen competitors come and go and companies bought and sold, some several times. 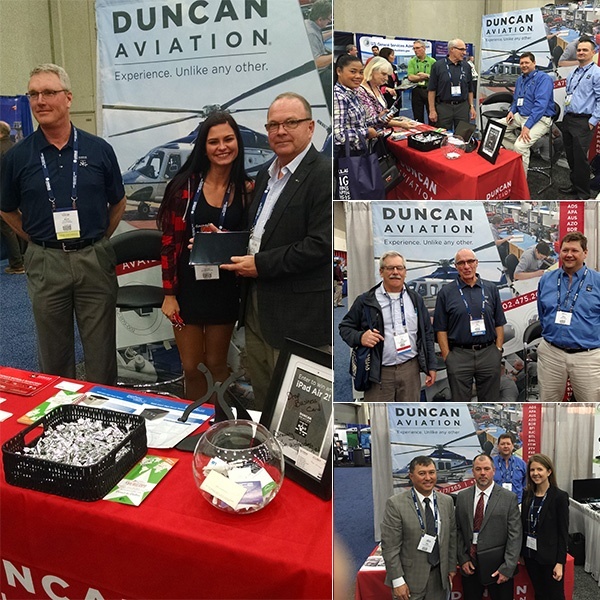 But, if you are looking for a company that has truly demonstrated stability, integrity, longevity; a company that will be here to support you not only this year, but for years to come, Duncan Aviation is the company you want to do business with.